Hey everyone, Deanna here with a fun project using the recently released dies from Lawn Fawn. I used the new Flamingo Together Dies and stamps. Here is what I have for you. I started by stamping out the flamingos on watercolor paper. I colored the flamingos with my Zig Clean Color Clear Brush Markers.. Next I stamped the palm trees and the trunks of the trees using Rich Cocoa and Cottage Ivy Memento ink. Now it was time to bring out the dies.. Using the dies from the Flamingo Together die set, I cut out the trees, trunks and the Flamingos. My sun rays are from a piece of patterned paper by Bo Bunny. I cut my waves from an older die I had on hand. However, Impression Obsession has a great wave die you can use. I used the Lawn Fawn Simple Stitched Hillside border dies to create my sand. I inked the edges of my "sand" using some Old Paper distress Ink. After adhering all of my pieces together I attached it to a 4 1/4" X 5 1/2" white card stock card base. I then stamped my sentiment from the stamp set with some Memento Rich Cocoa ink. Oh Deanna, this is so adorable and fun! What a sweet summer scene you've created! hahaha this is so sweet and gave me a little chuckle! 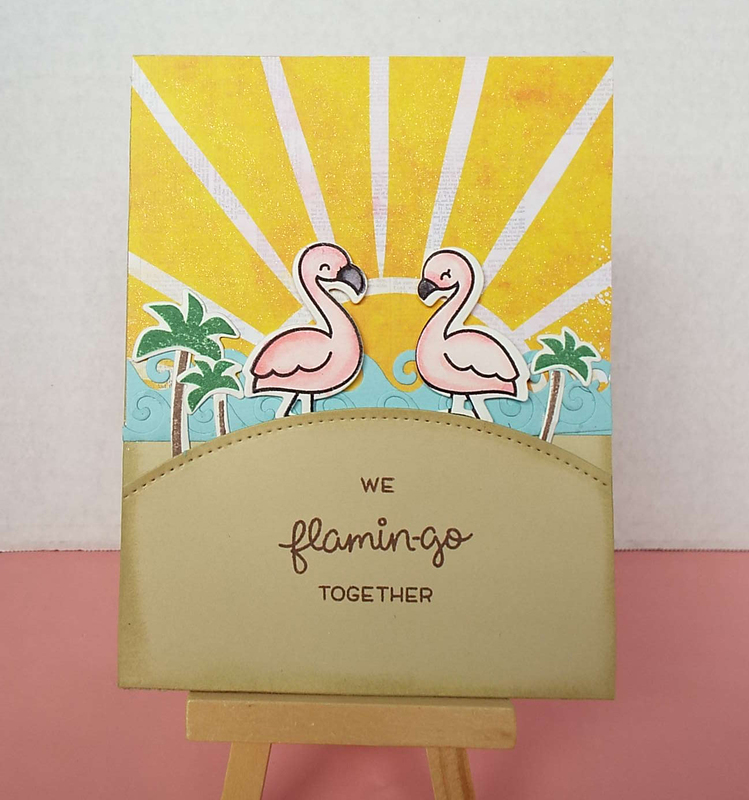 I love flamingo cards and your's is awesome with that sunburst behind it. A gorgeous bright sunny card! I recently visited a rooftop restaurant in London called The Roof Gardens Babylon where they had flamingoes wandering around in the gardens, seven floors up! An amazing sight to see.